the correct measures are implemented. Make sure your trees don’t get damaged. This outlines the intended method of works when working in our around trees to ensure the correct measures are implemented. This may be the case during excavation for a pool or trench. The purpose is to ensure that the trees do not get damaged due to bad work practices as this is often difficult or impossible to rectify after the event. It outlines in a step by step process what is to be done at certain stages of the work and at what time the advice or supervision of an arborist will be required. If you want to ensure that trees that are to be retained remain in good health during and after the project the work methods statements and supervision by an arborist is well recommended. 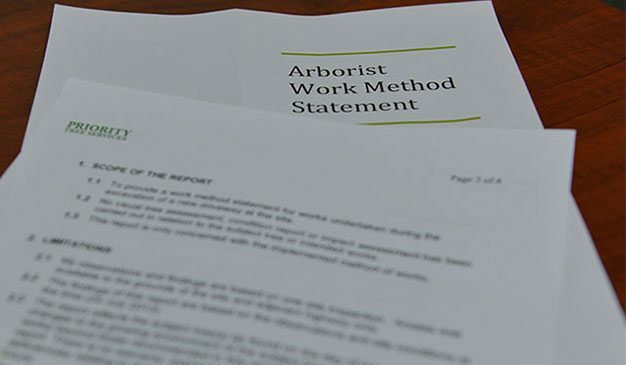 Based on the tree survey, the retention value and the proposed development the tree protection plan documents and describes the measures to be implemented to protect the trees adjacent or on the site which are to be retained. Correctly designed and implemented Tree Protection will ensure that retained trees are not adversely affected by the construction process. Councils can impose bonds and/or fines if trees which are to be retained become damaged during the construction process. It is therefore in the clients interest to adopt the recommendation of the consulting arborist. Where required we are to install tree protection measures and signage as required to meet the DA requirements. Please call us on (02) 9482 5353 or book a quote here. © 2019 Priority Tree Services. All rights reserved.